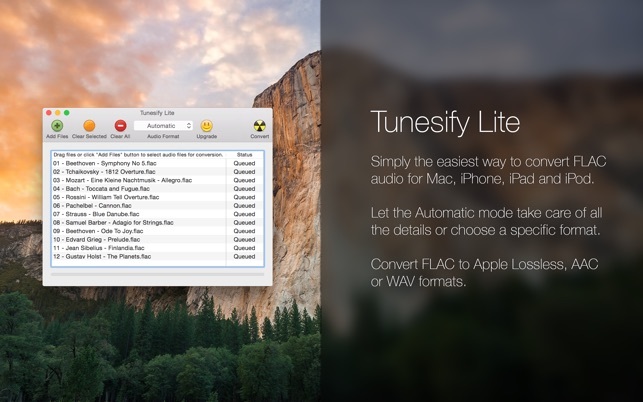 Tunesify Lite is the simplest way to convert FLAC (Free Lossless Audio Codec) files into formats supported by iTunes, iPods and iPhones. FLAC files can be converted to Apple Lossless, which preserves the true CD-quality sound. Files can also be converted to AAC or WAV formats. Tunesify Lite will also create 30 second previews of all audio files that are supported by the paid version of Tunesify. Upgrade to the full version of Tunesify to add support for converting many different audio formats such as WMA, WavPack, Monkey's Audio, WAV, FLV and Ogg Vorbis. 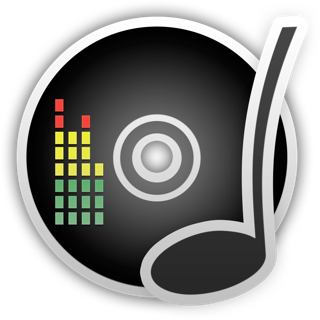 Tunesify also allows files to be converted to MP3, HE-AAC and AIFF formats. It can also convert files up to 4X faster on multicore computers. With the paid version of Tunesify you can choose encoding bit rates, encoding strategies, customize the automatic mode and automatically add songs to iTunes. 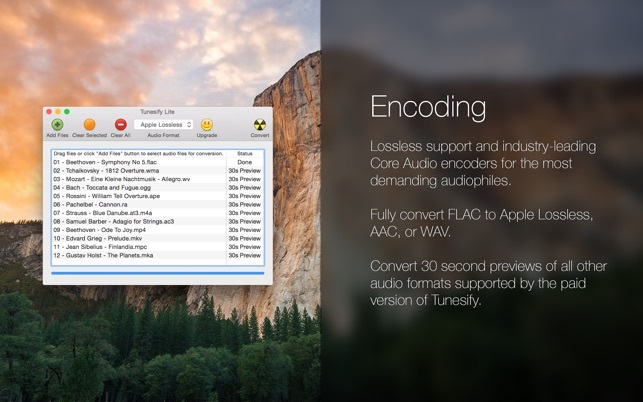 Tunesify Lite uses the Core Audio and LAME encoders in order to ensure the highest quality audio conversions. That's what is says it does. I tested both Apple Lossless and iTunes Plus settings, and the sound quality and file conversion (with tags) worked great. Reviewers who are dissing this *free* app are doing so because it only creates 30 second samples for other starting file types. The app provides the 30 second clips as a preview of what you can get for a paid upgrade. Those reviewers should really be reviewing this on its own merits, not what it doesn't claim to do. To the reviewer who said other apps are better, please tell us which one you like, so we can compare. Be aware that this app's interface is not elegant, it doesn't allow you to tweak the export settings, nor does it provide, in this lite version, many options (like where to send the exported files). It is however very simple, and very easy to use for most people wanting to convert flac files to m4a, etc. 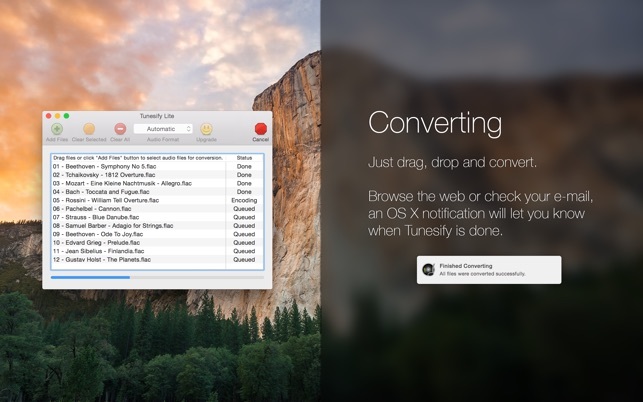 Just drag flac files in, choose export settings, and click convert. Exported files appear in the same folder as the source files. When you relaunch the app, your settings (which file export type) are remembered. Using the app on Mountain Lion to convert .flac files into .something-itunes-could-import files, opened the app, dragged the flacs into its "drop files here pane", hit the convert button, selected output folder, and it converted 15 flacs in less than a minute, without a hiccup. Perfect output for a perfect price. Note that, if you work the opposite direction and start by trying to open a .flac file directly, Mountain Lion doesn't know the application can open flac files, so you have to chancge the display option from "recommended apps" to "all apps", then Tunesify will not be greyed out and can to selected. It works perfectly done this way as well. Works very well and handles Unicode Filenames properly. As far as I can tell it even pulls song Metadata properly when converting. My only complaint is that it doesn't use multiple cores during conversion, but apparently this is a feature of upgrading. Holding out on something so small doesn't exactly make me want to jump up and upgrade, but if you're willing to wait this tool works just as it should.